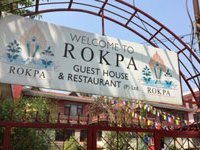 ROKPA: Nepal | ROKPA runs multiple relief projects which fight poverty and provide emergency help in Nepal. ROKPA gets children off the street, provides professional training for single mothers and serves warm meals to the homeless and destitute. ROKPA gets children off the street, provides professional training for single mothers and serves warm meals to the homeless and destitute. In brief: Thanks to your donations we can support the poorest of the poor in an effective and sustainable way – please help us to increase their chances for a life of dignity. The Republic of Nepal is counted amongst the poorest countries in the world. 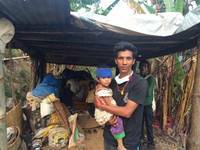 Around a quarter of the 29 million Nepalese live below the poverty line. Due to decreasing job opportunities and few educational ones in the mountain regions, migration to the Kathmandu valley is taking place. In the district of Boudhanath there are countless impoverished people who try to beg for something from the tourists and pilgrims. We provide humanitarian aid in this district. The discrimination and exploitation of women and children is widespread. Many children and young people end up in the streets, some resort to sniffing glue in order to feel less hungry. Under the motto 'Help for Self-help' we are influencing countless lives in a positive way. Thanks to your donations we are able to provide a home in the ROKPA Children's Home for former street kids. Furthermore we are supporting women in the Women's Workshop where we offer professional training to mothers in need and prepare them for an independent life. 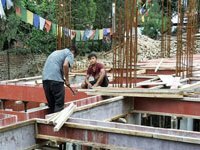 The opening of a new training center for young people and women from the poorest population groups, the Akong Rinpoche Memorial Center, is planned for 2018.